When people tell you why they want to retire abroad, a few big reasons crop up again and again: the lower cost of living…escaping the worst of the North American winter…finding a more adventurous life…access to excellent, affordable healthcare. But there are other benefits to embracing a life abroad—benefits most people don’t even think of. Many expats are pleasantly surprised to discover that you can also find a healthier lifestyle overseas—without even trying. In many of the world’s best retirement havens, embracing a healthier lifestyle just comes naturally. And it’s easy to see why. With warm weather year-round, it’s easy to get out and about whenever you feel like it. Abundant fresh air fills your lungs with each breath. With everything you need within walking distance, many expats can get by just fine without a car. And those extra yards you walk each day add up to a shrinking waistline over time. Lower costs make it much easier to eat healthily, too. In our healthy havens, you can stock up on farm-fresh produce at the market…fish straight out of the ocean…and enjoy meat that’s not laced with preservatives, steroids, and hormones…all for a fraction of the cost of doing it at home. All of which add up to a much healthier life. Today more than one third of U.S. adults are obese, according to the Centers for Disease Control (CDC), and that alarming trend shows no signs of abating. According to the CDC, the obesity rate among U.S. adults could reach 42% by 2030. Some 20% of Canadians are now obese, says Statistics Canada, and those numbers keep climbing, too. Given these awful statistics, you’ll be glad to hear that, without fail, expats cite their improved health as one of the biggest benefits of moving overseas—many have shed weight without even making a conscious effort. And they have seen their stress levels spiral down as the tensions of North American living ease away. Low stress leads to a healthier, happier life. All of these factors have even seen expats wean themselves off medications they depended upon back home. Such has been the positive influence moving overseas has had on their health. And they didn’t have to go through any great effort to do it. They just embraced the kind of lifestyle these places let you live—affordably and easily—every day. There are many places around the world where this effortlessly healthy lifestyle is just waiting for you to find it. Here are some of our favorites. Warren’s experience mirrors that of many expats in Ecuador, where healthy habits are easy to form. Though many folks move here for the nice spring-like climate, low cost of living, and interesting culture, they find that a pleasant by-product is better health. Here, living a healthy life just comes naturally. That wonderful, steady climate of not too hot and not too cold means that you spend more time outside, exercising without even trying. There’s no need to hole up in your house during a polar vortex or run for the safety of an air-conditioned building on a sweltering August afternoon. So whether you like to run marathons or just enjoy a casual stroll in nature, the weather in most areas won’t be a hindrance. Most of Ecuador is perfect for getting outdoors. In North America, most folks zip from errand to errand in their cars. But in Ecuador most expats (and locals) forego buying their own vehicle. Public transport is so cheap and convenient that most expats don’t need a car. So many people find themselves walking far more than they did back home. You can easily take a taxi or bus to most anywhere you need to go. But many find that if they’re only going a few blocks, they may as well walk. Over time, all those extra steps add up. It’s very common in Ecuador to hear expats say they’ve lost weight, lowered their blood pressure, and/or experience better overall health. Michael Griffin came to Cotacachi three years ago. He has lost more than 55 pounds in that time, due to the lifestyle changes that Ecuador encourages. He says that, given the choice between fruit or French fries, he’ll take the healthy option. While you’re walking, you inevitably find yourself stopping off at your favorite produce stand. Most towns have a large, official produce market, but you’ll also see plenty of fruit carts, kiosks, and small tiendas selling all manner of fresh fruits and veggies at dirt-cheap prices. Depending on the time of year, a dollar will get you five avocados, six large, sweet bell peppers, or 15 bananas. Small wonder you make a habit out of eating healthily. All this fresh, locally grown food available year-round means that many expats eat more healthily here. It’s easy to throw together a salad for two or a hearty soup when all the ingredients can be gathered up for just a couple of dollars. You can also take advantage of other people’s efforts, as Dennis D’Allesandro does at his little health-food consignment store. “People bring in things like mushrooms, goat cheese, and natural sundries,” says Dennis. For me, one of the best aspects of life on the equator is the low-stress environment. Life moves slower here and people tend not to sweat the small stuff. Once you’ve gotten into the rhythm of this lifestyle, it’s easy to feel life’s pressures melt away. This is a huge benefit to people with stress-related maladies like high blood pressure and anxiety. The irony of it all. The developing world…the developed world. There’s a big disconnect when it comes to health…and it’s the opposite of what you think. Low stress and good health often go hand in hand. And in Nicaragua, a low-stress lifestyle is hard not to come by. Let’s compare the stress. The U.S.: Rush hour traffic or traffic in general…drinking contaminated water that the government supplies. More and more negative news every day. Everything so expensive. People losing their jobs every day…people who now may never be able to retire. Now switch to Nicaragua: You may get rush-hour traffic if you’re late to meet someone for cocktails and there’s a herd of cattle in front of your car. Everything is close by when you live here; you really don’t even need a vehicle. You have your own well; you have your own fresh water from underground rivers. And very few of us listen to the news anymore. The outdoor life you find yourself living in Nicaragua inevitably lowers your stress levels. It’s warm and sunny almost every day. With coastlines on the Caribbean and Pacific, volcanoes, mountains, and large, scenic lakes, swimming and hiking opportunities abound. The outdoor life you find yourself living in Nicaragua inevitably lowers your stress levels. 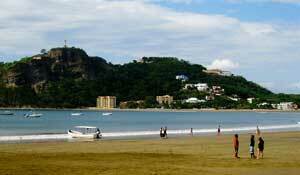 It costs a couple around $1,200 to $1,500 a month to live in Nicaragua, all in. Such low costs play a big part in making this a low-stress retirement haven. With no financial worries, you are free to enjoy every day as it comes. The shortage of stress in Nicaragua is complimented by the abundance of healthy food here. “Free-range” in the U.S. only means that chickens live in larger cages. Companies treat farmed fish in regular supermarkets with antibiotics and chemicals to make them larger. You can find the good stuff, but you have to pay big bucks for it. In the States, an apple from the grocery store can sit in your refrigerator, and when you find it hiding in a back corner and eat it months later, it’s just as firm and crunchy as the day you bought it. Ever wonder why? Fresh, caught-that-morning fish is so economical in Nicaragua that people eat more of it. A pound of red snapper in the beach town of San Juan del Sur is about $2.87; last summer I saw it go for $34.95 a pound in Manhattan (and that was frozen, not fresh). Chickens and cattle roam freely in the pasture in Nicaragua, something they used to do in the States before agribusiness got in the way. “Fresh eggs, fresh bread, fresh lobsters, fresh fish, fresh veggies… No chemicals. What more can we ask for?” says expat Marion T. Moore from Michigan. A bag of cucumbers, carrots, red onions, a small watermelon, oranges, chia seeds, tomatoes, and avocado bought at a local Nicaraguan market may cost you no more than $5. Singles living here can eat on $25 a week. The Brodeur’s story is not unique. They’re just two of the many expats who come to Panama and lose weight without even trying. For me, zero winter weather means I never crave thick cream sauces, stews, or other stick-to-your-ribs fare. When you’re sitting on a sunny restaurant patio, menu items like grilled fish or lemony, cold ceviche are the most appealing. And if they happen to be healthier than your usual restaurant fare, that’s just an added bonus. With year-round sunshine and mild weather, Panama tempts you outdoors everyday…forcing you to work off calories without even thinking about it. There’s so much to see and do (most of it outdoors) that no one wants to spend hours cooking. The Brodeurs discovered this when they moved to Las Tablas in 2014. 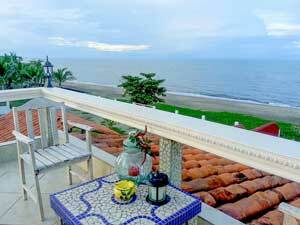 Known as Panama’s Dry Arc, the Las Tablas region is known for bright sunshine and very little rain. With year-round sunshine and mild weather, Panama tempts you outdoors everyday…forcing you to work off calories without even thinking about it. “With the hot, sunny weather, we don’t eat as much. I’ve dropped a whole size,” says Joyclyn. The Brodeurs do most of their traveling by foot, as many of the locals do. Though they weren’t necessarily trying to slim down, they did. And it’s not just the great weather in Panama that lets you lose weight with zero effort. Eating healthier is easier to. Outside of Panama’s capital, you won’t find fast-food joints on every corner. Pot roasts and meat loaf give way to fresh, sushi-grade tuna, with exotic fruits for dessert. It’s hard to resist the fragrant mangos, papayas, pineapples, and bananas that grow all over Panama. Walk into any market—they are plentiful here—and you’ll see mounds of colorful produce costing a fraction of what you’d pay in the U.S. or Canada. “We have a papaya tree in the backyard and nowadays we have fresh papaya regularly for breakfast,” says Armand Brodeur. Connie and Mikkel Moller live in the fishing village of Pedasí, where they grow all manner of good things right in their back yard. From aloe to papaya, they have it all. Surrounded by pristine, uncrowded beaches, the region attracts expats who enjoy world-class fishing or simply want to live by the water. Amid such serene surroundings, it’s no wonder so many expats see their blood pressure—and their waistlines—drop after moving to Panama. Every Sunday and holiday, cities across Colombia—Medellín, Bogotá, Cali, Santa Marta, and others—close down large segments of the main streets to motorized vehicles. Between 7 a.m. and 2 p.m. these roads become pedestrian streets for walkers, joggers, cyclists, and roller-bladers. This is called ciclovía. And it’s just one example of the active, outdoor lifestyle you can have in Colombia, thanks to the year-round wonderful weather. My husband Mike and I have lived in Medellín for four years. “I walk so much more now than when I lived in Maine,” says Mike, who attributes his 40-pound weight loss to being more active and eating healthier food here. 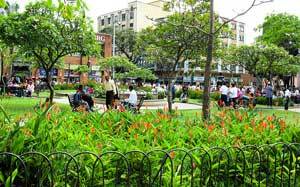 Steve and Pat Turney echo our sentiments about the active lifestyle to be found in Medellín. Pat refers to Medellín as “a city with a built-in weight-management program,” due to all the walking you can do. As an added bonus, Steve is convinced that the fresh, non-radiated food he gets from the farmers’ market has actually reduced his PSA level (and his likelihood of prostate cancer). This dramatic change in lifestyle has worked wonders for the couple. Increased exercise, good, natural food, and the low-stress environment have all contributed to their improved well-being. “Within the first six to seven months of living here, we each lost 10 pounds and kept it off—without even trying!” says Kate with pride. It’s not just the active lifestyle. Eating more healthily is certainly no chore in Colombia. The canned soup aisle in the supermarket here consists of six cans, all imported from the U.S. Colombians make soup daily from scratch, with real food and no preservatives. When fresh vegetables, fruit, and chemical-free food is so plentiful, why would anyone want to eat something from a can? 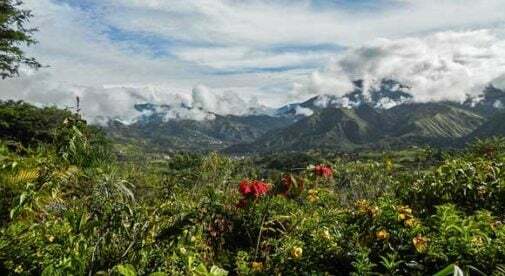 “My high blood pressure has come down almost completely,” says Nel Cameron, 68, who lives in Escazú, a suburb of Costa Rica’s capital, San José. Robbie Felix has the chronic illness lupus. 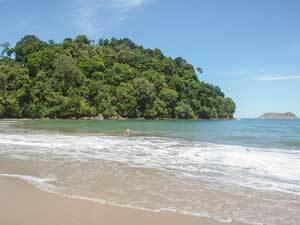 But she found relief from her symptoms (including arthritis and skin allergies) after arriving in Costa Rica.